Although, the diagnosis of invasive melanoma is a sobering reality, the majority of melanomas in the United States are not life-threatening. Many are melanomas in situ, and many more are only superficially invasive with little chance of metastases. The risk and staging is stratified based on the depth of invasion. Less than 0.8 mm depth of invasion, 1-2 mm, 2-4 mm, and more than 4 mm. In addition, the presence of ulceration worsens the stage and prognosis. These criteria describe T staging of AJCC (2016). N staging is defined by presence of regional / lymph node metastases, in-transit or satellite metastases. M staging describes distant metastases to regional muscle or skin, lung, other organs, or CNS / brain. 84% of patients with melanoma present with localized disease only. 5 year survival for patients with tumors 1mm or less is 90%. Survival rate for tumors more than 1 mm thickness ranges from 50 - 90%. Once lymph nodes are involved (Stage III), the 5 year survival rate ranges from 20 - 70%. For stage IV melanomas with distant metastases, long-term survival has historically been less than 10%. However, with recent development of effective systemic therapies this is changing this rapidly. Acral melanomas (soles, palms, and sub-ungal). There are also melanomas arising on mucosal surfaces, uveal tract of eye, or leptomeninges. Genetic variation in melanomas is becoming better understood. BRAF mutations and KIT aberrations are represented differently in the different subtypes above. Most notably, BRAF mutation is found in 56% of non-CSD subtypes. KIT aberrations are found in roughly a third of CSD, acral, and mucosal subtypes. NRAS mutations are found in less than 20% of the subtypes. Metastatic treatment of melanomas has progressed with the introduction of targeted therapy to BRAF and MEK inhibitors and immune checkpoint blockade to anti- PD-1, anti-PD-L1, and anti-CTLA4. The characteristic of BRAF / MEK response tends to be short-lived. On the other hand, the characteristic of immune checkpoint inhibitor such as anti-PD-1 tends to be durable, with lower response rate. The treatment strategies involve BRAF / MEK induction followed by immunotherapy for sustained response. Current staging strategies involve routine tumor testing for BRAF and PD-1. Interestingly, even with no PD-L1 expression, tumors still respond to this immune checkpoint blockade, just not as well as those that express it. 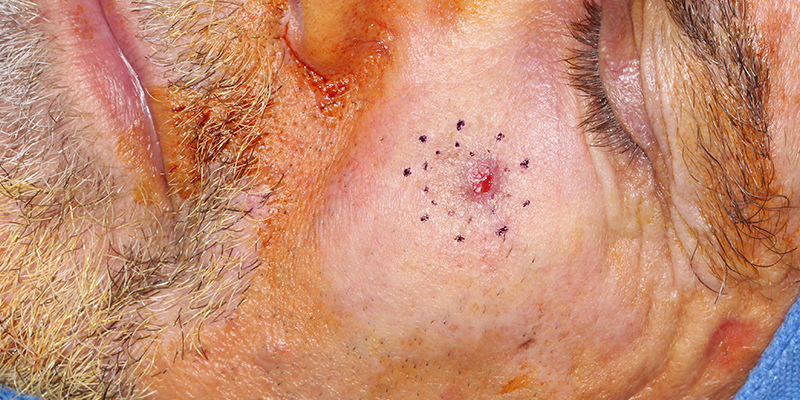 Surgical management of melanomas is still the standard of care. Primary tumors require wide local excision with margins dependent upon the tumor thickness. Lymph node treatment is still considered a necessary palliative approach with clinically involved lymph nodes. Sentinel lymph node biopsies (SLNB) in N0 neck with no detectable lymph nodes is reserved for T1b lesions (< 0.8 mm thick with ulceration or 0.8 - 1.0 mm thick with or without ulceration). The decision of sentinel lymph node biopsy must include patient factors of comorbidities and patient preference. Although SLNB is an important staging tool, its ability to improve survival is limited to at most a narrow subsets of patients. Imaging of melanomas include ultrasound of the nodal bed, MRI, and CT/PET scans.